Nashville, TN (November 29, 2011) – Exciting male trio and Mansion Entertainment recording artist, THREE BRIDGES, is the featured artist on this week’s edition of THE GOSPEL GREATS WITH PAUL HEIL. The popular radio show will be aired on the weekend of December 3rd and 4th, 2011. Tune-in to The Gospel Greats on a radio station near you this weekend. To find a station in your area, visit www.thegospelgreats.com/search/. 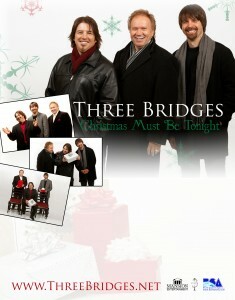 “Christmas Must Be Tonight”, is available at www.threebridges.net, on iTunes, or from your local Christian music distributor. For more information about Three Bridges appearances or for scheduling please visit the Beckie Simmons Agency at www.bsaworld.com.